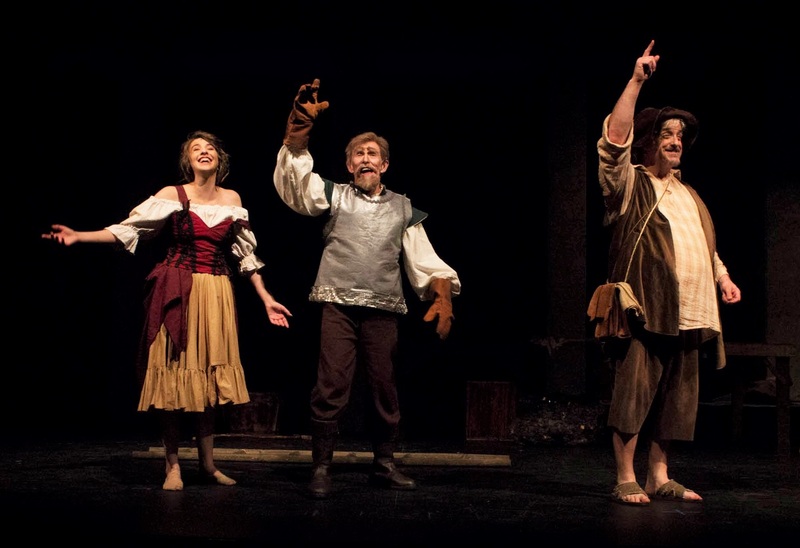 Ghostlight Theatre Ensemble's inaugural production of Man of La Mancha opened this past weekend, receiving rave reviews and standing ovations for each curtain call. The praise continued on Facebook, with attendees urging friends and family to see the show. "Bart and I saw this last night. The performances we're incredible and the set will impact you from the moment you walk into the theater. If you have the chance, you should really check out the show," commented Patty Schneider. "I just watched Man of La Mancha, and was totally blown away by the talent of the ensemble and orchestra. Congratulations to everyone involved in this remarkable production," said Susan Laird. Directed by Helen Dixon, Man of La Mancha celebrates the perseverance of a dying old man who refuses to relinquish his ideals or his passion. The show features intense performances from principals Richard Howarter (Cervantes/Alonso Quijana/Don Quixote) and Mikayla Thompson (Aldonza/Dulcinea), juxtaposed with comedic moments from Chris Finetti (Sancho Panza) and Kal Berns (Innkeeper/Governor). Jesse Rodriguez (Padre; Muleteer; Guitar Player), Hugh Patterson II (The Duke/Dr. Carrasco/Knight of the Mirrors), Justice Krugman (Barber; Muleteer), Emilio Lopez (Pedro; Captain of the Inquisition), Josh Velasquez (Anselmo), Wendy Rodriguez (Housekeeper), Hayley Finetti (Antonia) and Kevin Coren (Muleteer) and the entire ensemble create a stand-out cast that bring this play-within-a-play to life. "Wonderful to see Richard Howarter on stage, I can assure you of that. Long time Bay Area performer with amazing talents," said Don Wilson on Facebook. "Ghostlight Theatre Ensemble’s very first show is Man of La Mancha and it’s really something special. It’s a beautiful show about idealism and seeing the best even when the worst is right in front of you. Shout out to the wonderful direction of Helen Dixon, to the incredible performance and photography of Chris Finetti, to the quick learning and great work of my dad, Kevin Coren, and to Mikayla Thompson, who entered the stage by throwing a loaf of bread and got the closest to making me cry at the end with one sentence," shared Levi Coren via Facebook. "I'm so humbled by everyone's comments, and thrilled that our community has the opportunity to see high-quality local live theatre, right here in Brentwood. And the story and message of Man of La Mancha is particularly close to my heart. I hope that word of mouth spreads, enabling us to share this show with many more people this weekend," said Finetti. Performances continue this weekend at The Theatre at Edna Hill, located at 140 Birch Street in Brentwood, with evening shows on July 20th and 21st at 7:30pm, and matinees on July 21st and 22nd at 2pm. Tickets are $20 for general admission, and $15 for youth (14-18) and seniors (60+). Tickets for children 13 and under are $13; however, this show has mature themes, and is recommended for ages 14 and up. For more information, or to purchase tickets, visit www.ghostlightte.org.